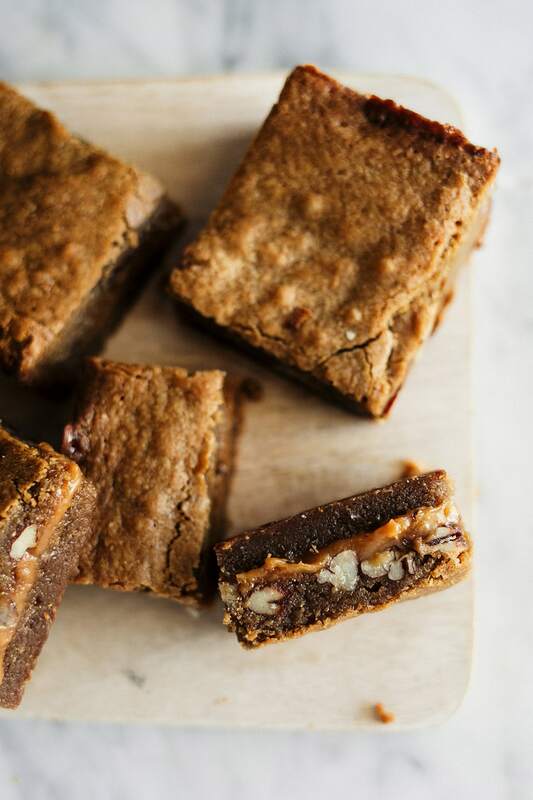 Caramel Pecan Blondies feature an ultra chewy brown sugar blondie with a hidden layer of rich, gooey, and crunchy caramel pecan filling. Out of this world! Taste: Super rich and sweet! Almond like a cross between caramel fudge and blondies. Texture: My favorite part. 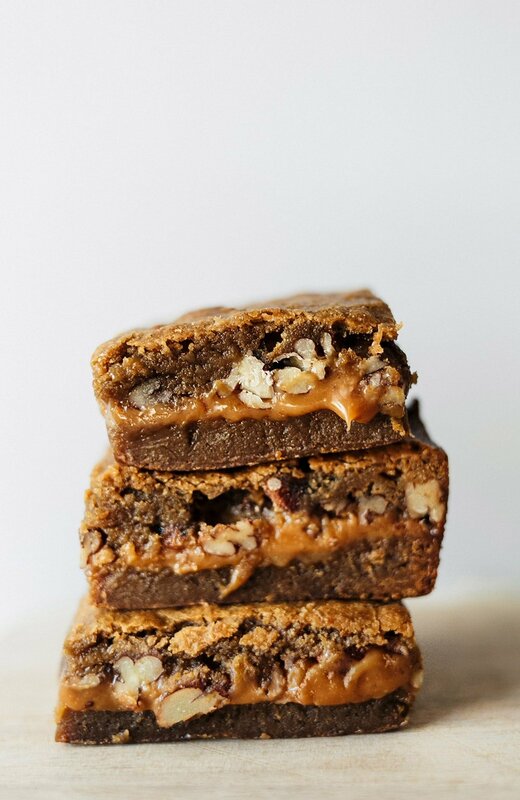 Chewy yet gooey, crunchy yet soft, everything you could want in a single bite! 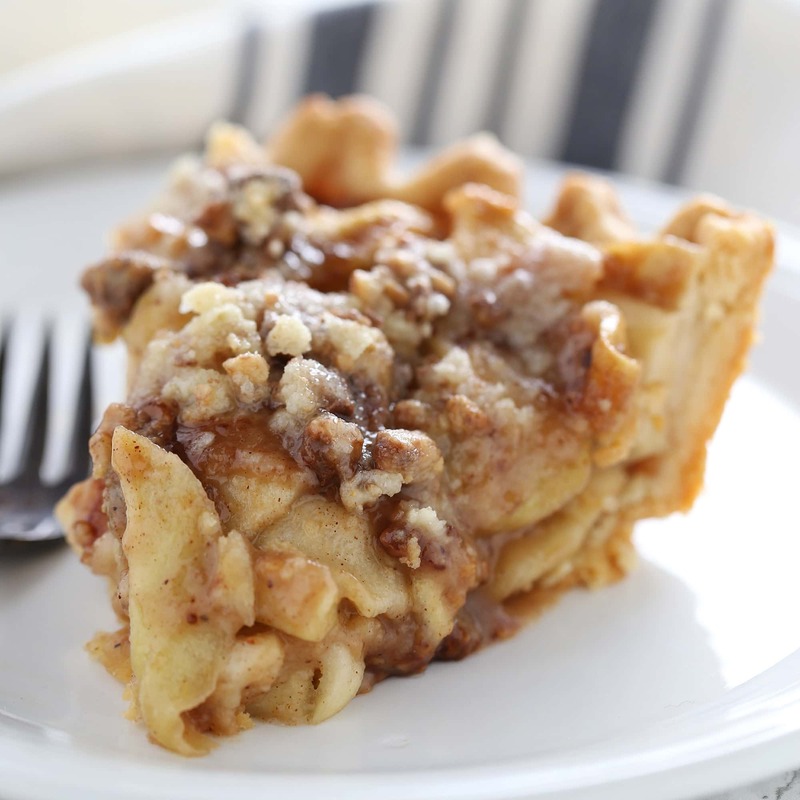 Pros: Fun twist on a blondie, and perfect for fall. Many of my most popular Instagram images feature the most ooey, gooey, and sinful treats I’ve managed to create. You know the photos. Where you can basically see what taking a bite would feel like. That’s not easy to accomplish, but I think we’ve managed to do it hee with these Caramel Pecan Blondies. Can’t you just imagine yourself taking a bite out of one of these? 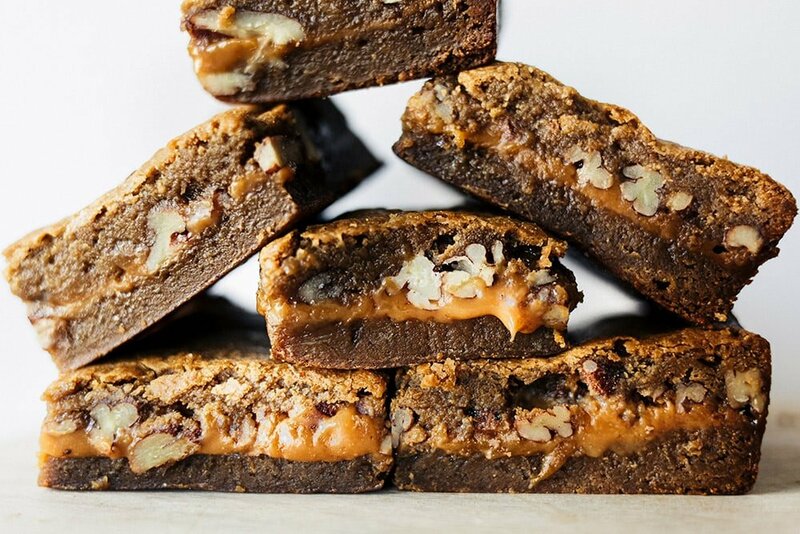 The chewy blondies, the gooey caramel, and the crunchy pecans? It’s a trifecta of textures that can’t be matched. Plus I just love that there’s a small fall twist on these blondies that makes them perfect now that the weather is cooling off. 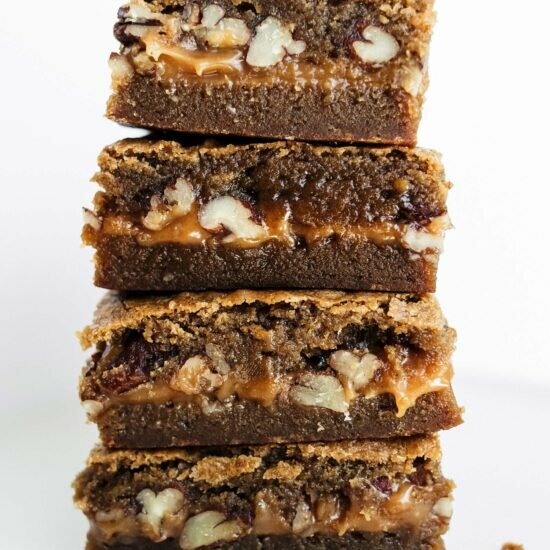 Although I cut these into big squares in these photos, these blondies are ultra rich and definitely on the sweet side. If you’re serving a crowd cutting smaller pieces will absolutely suffice. This recipe is actually super simple, too. The caramel in the middle is “short cut” caramel using melted down caramel squares from the store. I used the Kraft brand. I would also recommend using a metal pan to bake these, at they’ll cook much quicker. Glass or ceramic will cook much slower. If you decide to give this recipe a try, be sure to snap a photo to share, tagging me and #handletheheat on Instagram! Photos by Lauren J. Photography. Preheat the oven to 350°F. Line an 8 by 8-inch pan with foil or parchment. Spray with nonstick cooking spray. Don't skip this, the caramel filling gets sticky! In a large bowl combine the butter and sugar with a rubber spatula. Add the eggs, egg yolk, molasses, and vanilla and stir until combined. Stir in the salt and flour. Pour half the batter into the prepared pan. Bake for 15 minutes, or until the top begins to set. Keep oven at 350°F. Meanwhile, combine the unwrapped candies with the cream in a microwave safe bowl. Microwave in 30 second bursts, stirring between bursts, until the mixture is melted and smooth. Stir in the pecans. Pour the caramel over the middle of the bottom baked blondie layer. Pour the remaining batter over the caramel layer is completely covered. Return to the 350°F oven and bake for another 30 minutes, or until golden brown and set. Let cool completely before chopping into bars with a big sharp knife. Wipe the blade with hot water for cleaner slices. Serve or store in an airtight container at room temperature for up to 3 days. My caramel layer completely dissolved into the blondie. You definitely need the first layer to be almost solid before the caramel goes on. Unfortunately, the bottom was also overcooked by the time the top was baked. Think an adjustment on temperature or the consistency of the caramel is in order. I used Werther’s caramels. Oh no, Allison! I’ve never used Wether’s soft caramels before, I’ve only ever seen their hard ones! Curious about that. What kind of baking pan did you use? Hello Tessa! These look delectable! Thanks for posting yet another yummy recipe 🙂 I’m in Australia and am finding it super hard to source “soft caramels” as the ones sold here are hard caramel candies! I’m wondering what is meant by a soft caramel? Is that a jersey caramel? They are little squares of caramel that come individually wrapped that you can bite into and have a soft yet chewy texture. They’re most commonly sold under the brand Kraft here in the U.S. I believe it’s similar to jersey caramel but I’m not certain how that would work in this recipe. Sorry I couldn’t be more helpful! The picture of the caramel pecan blondies looks like there is chocolate in them and I don’t see cocoa listed in the ingredients and am confused. Cheers for the super helpful pointers! Will hunt down those caramel goodies Happy baking! wondering if I can use homemade caramel sauce? Amazing trifecta! Thank you for sharing these! Nice combination of texture and flavor, good tip too about serving them in smaller sizes given how sweet they are! Made these today and they are so gooey that they were hard to cut and didn’t stay together. They were definitely cooked all the way so I am not sure what happened. I also made sure to wait till they were completely cooled. Hi, Kristin! I’m sorry to hear that! I know a few other people have successfully made this recipe so I have a couple ideas of what could’ve gone wrong. Firstly, what kind of baking pan did you use? can I skill the molasses !! Can I use light brown sugar instead of dark? I had similar issues as Allison, I used werthers soft caramels too and a glass baking pan. I ended up just layering the caramel and pecans even though the bottom layer was not done cooking- it all melted together, I tried to put top layer over it but that melted together too. It did cook through in the 30 min and its cooling now, I cut a side piece and its all melted together but it’s not burned (because I didn’t cook bottom completely it was soft and mushy in center, set on edges) it is still good just not as pretty as pictured. I am going to try it again tho, I found Kraft caramel round baking pieces, maybe try those and a metal pan next time?? Update I used a metal pan and the craft Caramel baking bits and success !!! The blondie batter came out really thick and hard to work with. is that normal? I just made these blondies and they did not last long in my house!! My family raved how great they were and now they want another batch of blondies!! I followed your recipe and directions exactly and the blondies came out perfect. 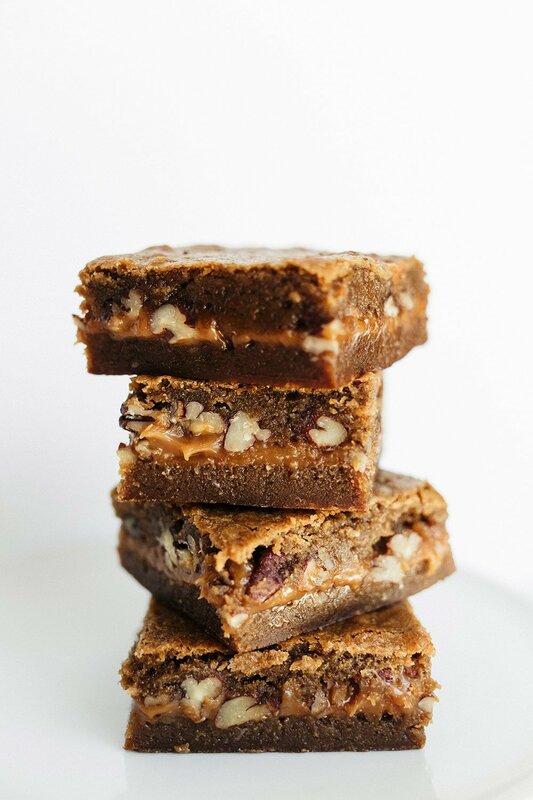 The caramel and pecan layer really take this blondie to another level of goodness!! This recipe went straight to my recipe book!! Hi Tessa! I’m a new fan from the Philippines. Can i use cake flour in this blondies instead of all purpose? Thanks in advance! Quick silly question – you state to place unwrapped caramel with cream in Microwave- you don’t take off the wrappers? Hi Tessa! Just wondering….should the first layer cool a bit before adding the caramel layer? I added the caramel immediately after taking the first layer out of the oven. Although mine taste great, everything kind of melted together. I used a metal pan and let them cool almost completely. They’re delicious, just not as pretty as yours. 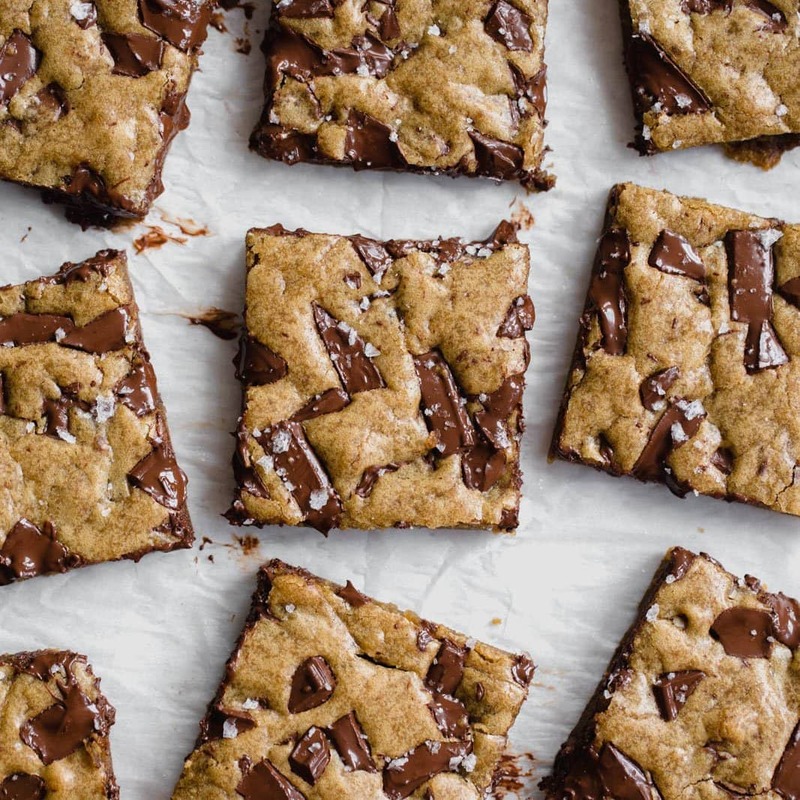 Can you add chocolate chips to the blondie portion? How would the rest of the recipe need to be modified to accommodate? I am totally delighted with these! 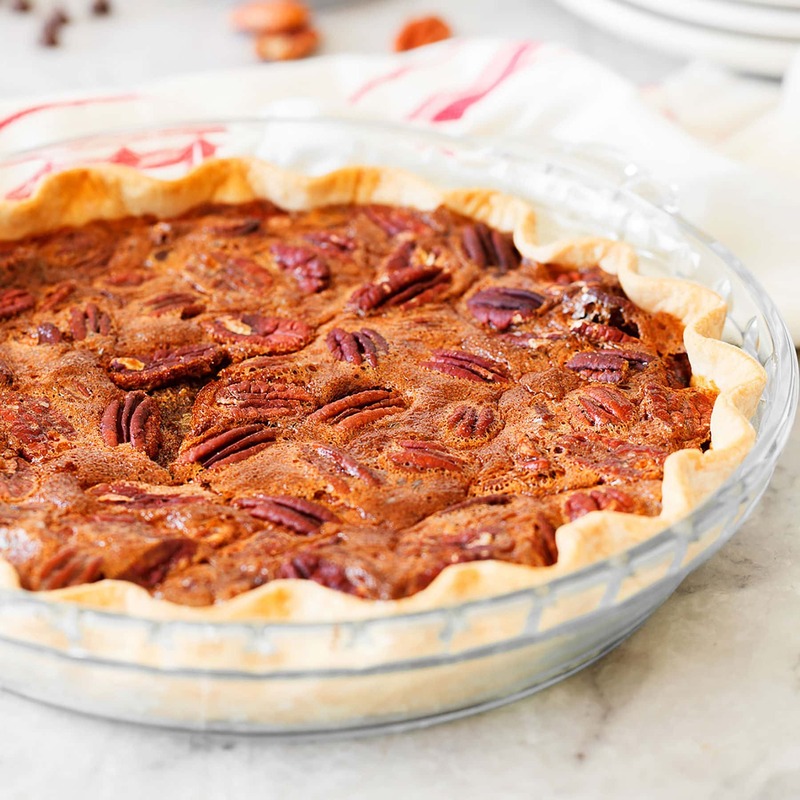 Made a batch yesterday and was a bit sceptical because they just look so delicious in the photos, almost too good to be easily made 🙂 However they turned out perfect – gooey, rich, with crispy pecans. Can i use homemade caramel sauce or ready to use caramel sauce instead of candies ?? I couldnt wait for your answer and made this blondies wirh homemade caramel and it was quite perfect .I just reduced the amount of sugar in the cake. I cut them into squares and I am wondering if i can freeze them too ? Oh my word!! I made these yesterday and they came out absolutely delicious! The short list of ingredients makes the recipe super easy to make and quick. Mine came out super chewy and soft. I used werthers soft caramels and they still came out very good! I highly recommend using the metal pan as it makes a huge difference and I lined it with parchment paper which made cutting them so easy. Love this recipe Tessa thank you!